Interior illustrations from Drawn Together written by Minh Lê and illustrated by Dan Santat, Disney-Hyperion ©2018. 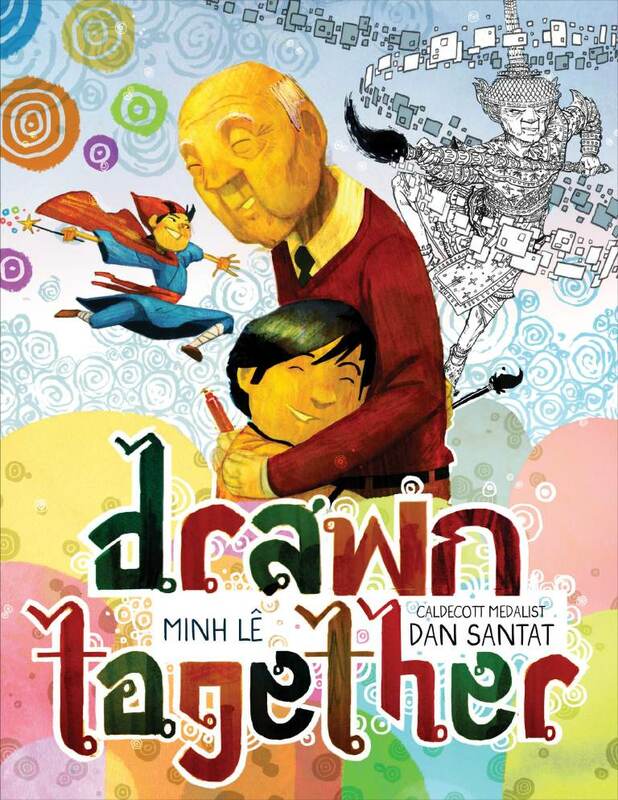 Drawn Together is one of my favorite picture books of 2018 and not just because it has a clever title. 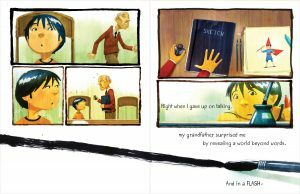 Lê’s spare text perfectly captures the tale of a boy and his grandfather who are separated by words but find a way to connect through drawing—a feel-good story that crosses cultures and time. 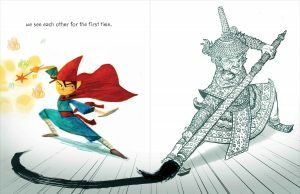 Interior spread from Drawn Together written by Minh Lê and illustrated by Dan Santat, Disney-Hyperion ©2018. Santat’s gorgeous art alternates between vivid modern color for the grandson’s images and a black-and-white traditional style when the grandfather draws. The book’s beauty will move you. The publisher includes clever details such as a sharp pencil on the spine and a surprise image beneath the cover; the two characters’ contrasting art styles serve as lovely bookends. 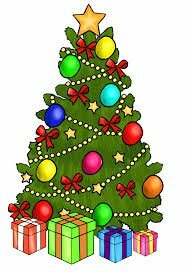 This book would make an ideal gift for that special child in your life who speaks a different language than you do, although any child will find it speaks to them about connectivity and family ties. 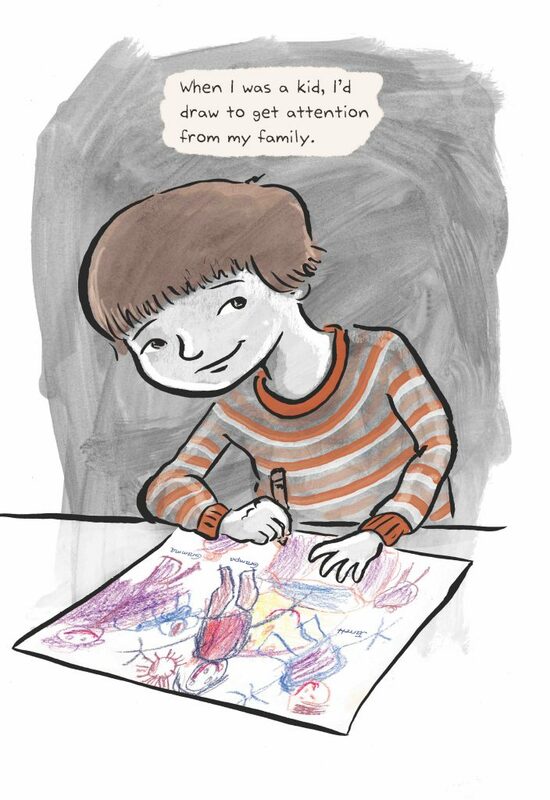 It is also befitting for kids who love to draw because the book shows how pictures open up worlds. 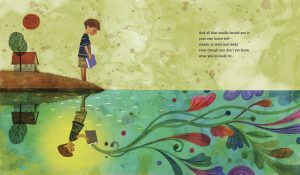 Interior spread from The Day You Begin written by Jacqueline Woodson and illustrated by Rafael López, Nancy Paulsen Books ©2018. The Day You Begin isn’t about the day you’re born. 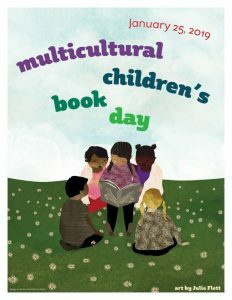 Instead, this heartening 32-page picture book invites you to make a space for yourself in the world. Woodson grabs the reader from the empathetic first line, “There will be times when you walk into a room and no one there is quite like you.” Those words give voice to the uneasiness we all experience. Yet, to forge connections we must learn to take a chance and open up. López takes the story beyond the words. His colorful artwork imaginatively captures the emotional tone, showing conflicting feelings of hope and despair, isolation and togetherness.This lovely tale reaches hearts of all ages. 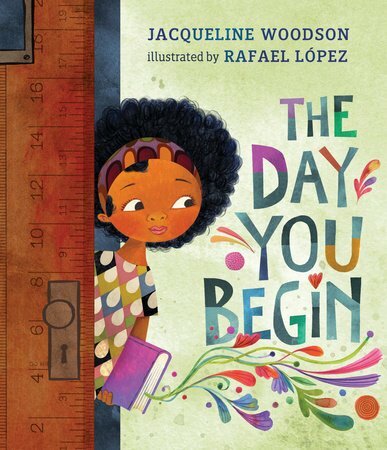 The Day You Begin would be an ideal gift for graduates, people seeking to begin anew, or anyone who needs a nudge to remember that life is a beautiful blend of our differences.This story was inspired by a poem in Woodson’s New York Timesbest-selling memoir, Brown Girl Dreaming. 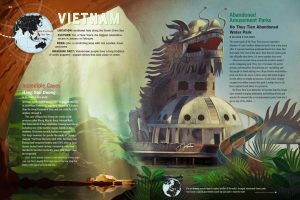 Interior spread from The Atlas Obscura Explorer’s Guide for the World’s Most Adventurous Kid by Dylan Thuras and Rosemary Mosco with illustrations by Joy Ang, Workman Publishing ©2018. 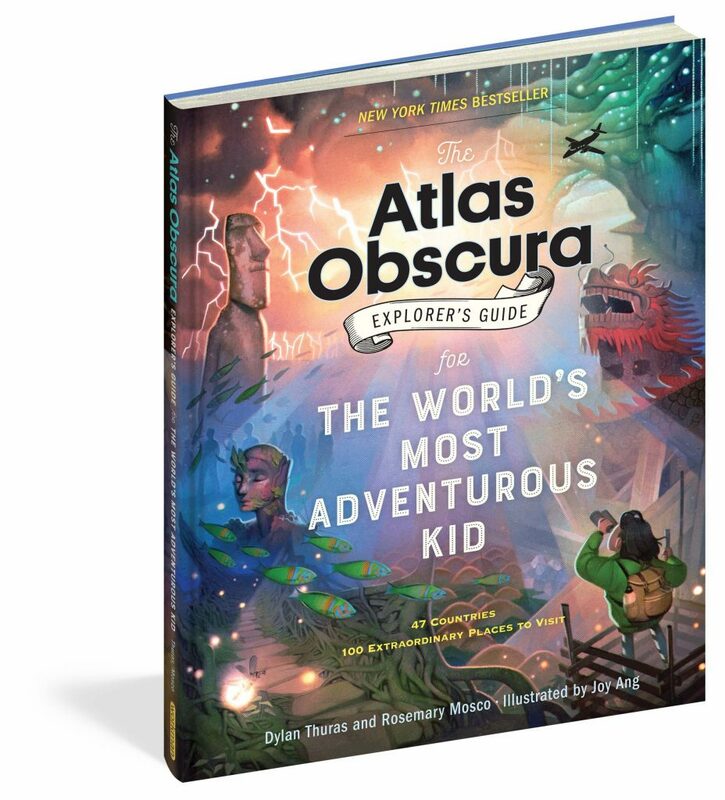 The Atlas Obscura Explorer’s Guide for the World’s Most Adventurous Kid is THE book for that kid on your holiday shopping list who loves extraordinary facts. Who knew there was a school in Iceland dedicated to the study of elves, or that fireflies in Tennessee blink in sync with one another?Travel to destinations in forty-seven countries on every continent in this entertaining journey to 100 real places. The book opens with a clever Packing List and Adventure Plan (Table of Contents). Readers can randomly choose places to explore, or read the book straight through. Each two-page spread highlights segments that are stand-alone entries, yet there’s a teaser at the end connecting a topic from that country to the next one. 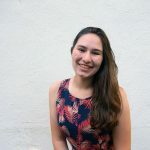 For example, after reading about how Cambodians built their own bamboo trains called “norries” (when the war damaged their rail system), you’re invited to read about another do-it-yourself system of transportation in Colombia—homemade zip lines! Parents who find themselves unable to put this book down can ask Santa for the adult version: #1 New York Times best-seller, The Atlas Obscura: An Explorer’s Guide to the World’s Hidden Wonders. 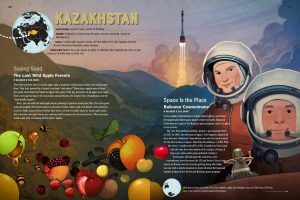 Whether young or old, the Atlas Obscura books take you on a fascinating spin around the globe delivering strange facts in the most delightful way. “It must be hard to write a graphic novel about one’s own childhood,” I thought to myself as I opened the book Hey, Kiddo. I remembered meeting the author, Jarrett Krosocszka, years ago in California. He was a bright, sweet man with an open demeanor and ready smile. He reminded me so much of my own brother. I had put that memory right next to his Lunch Lady books in my mind, and they sat on the shelf of memory happily together, side by side. I remember hearing about his forthcoming book, Hey Kiddo, and I knew both the writing about a troubled youth and the reading about it would be a challenge. Interior illustration from Hey, Kiddo written and illustrated by Jarrett J. Krosoczka, Scholastic Books ©2018. As it turns out, Jarrett has written so beautifully about that time that I could not be prouder of him if he had been my own family. Jarrett’s mother, Leslie, suffered from a heroine addiction. She was in and out of jail, and in and out of Jarrett’s young life. He never knew who his father was until he was older. His amazing and often exasperating grandparents stepped in as true parents. 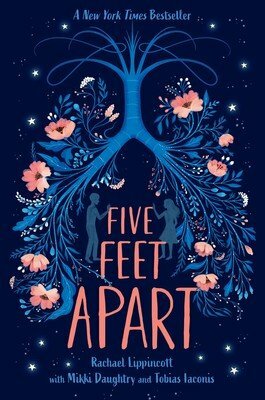 This book feels close to home in my heart because it’s about family. It’s Jarrett’s grandparents that I wanted to hug for all the sweet things they did for him. And at times I wanted to sit them down for a good talk! Still, how wonderful they were to him. Wonderful because they loved him deeply and it showed. For all that they smoked, drank, and quarreled all the while they loved Jarrett with a heart and a hat. Hey, Kiddo sometimes reads as though Jarrett has written it from the perspective of a loving investigator of his own childhood. The author includes small and intimate touches like an image of the actual wallpaper pattern from his grandparent’s home. As we read we step into his childhood world. Also included are photographs of the family along with letters from his mother, Leslie, originating from her time in prison. 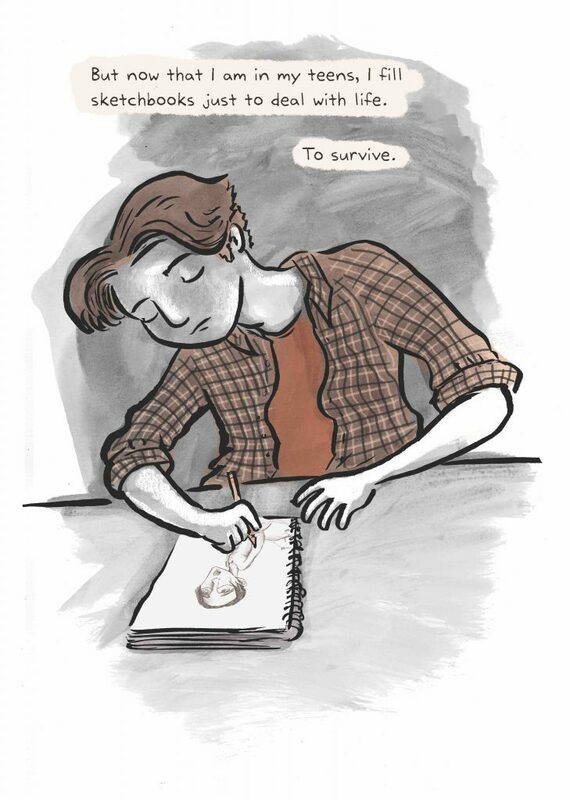 There are drawings by Leslie just for Jarrett. It’s those letters that show how much she loved him and missed him. I read the book in one sitting, and when I put it down, I thought of Jarrett’s grandparents, Joe and Shirl. I thought that for all that Jarrett had been through, Joe and Shirl were always there for him. Actually, they still are in the way that love can never pass from us completely when it is given with such readiness and generosity. That kind of love death cannot touch. So, now on that same shelf of memory I have about Jarrett are his endearing personality, his ready smile, the Lunch Lady books, a difficult childhood and right beside that childhood is a place for Joe, Shirl, and their Love for him. That was, and is, a love with a capital “l” for sure. 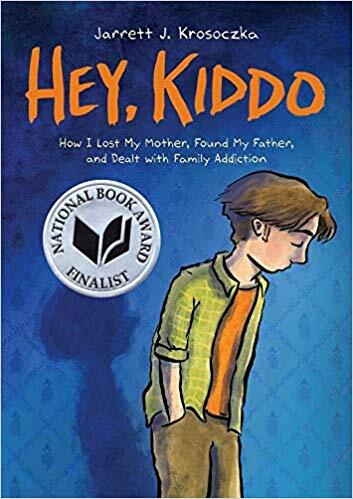 Hey, Kiddo was a finalist for the National Book Award and is a highly recommended graphic novel for teens and grownups. HT: This is perhaps less of a question and more of an opportunity to tell us why author/illustrator visits to schools are so important. Clearly, a school visit from an illustrator changed your life. 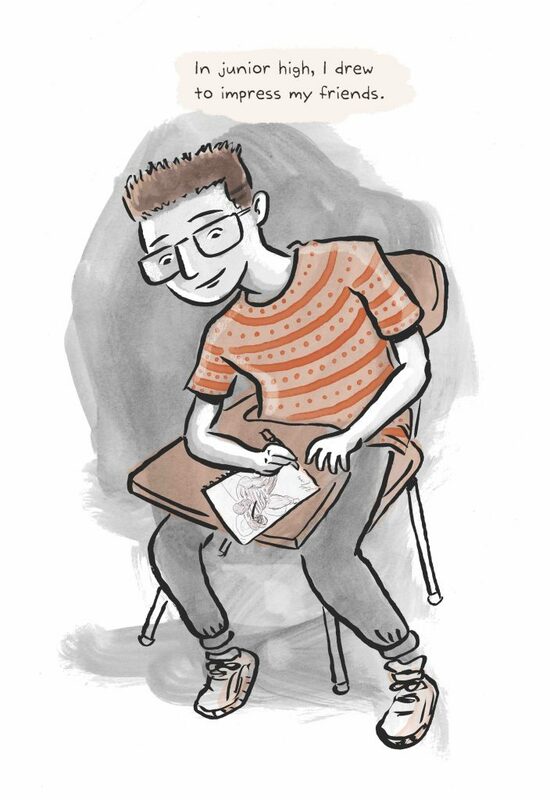 What would you say to a debut author or illustrator about what that school visit meant to you? Work on an engaging presentation to keep the students’ attention. Enjoy the quiet moments where you can connect on a more one-on-one with the students. HT: I think what I learned from reading your book, and reading in general, is that when we feel alone in a painful situation we seldom are. I think this book will resonate with so many readers. Thank you for it. It’s beautiful. 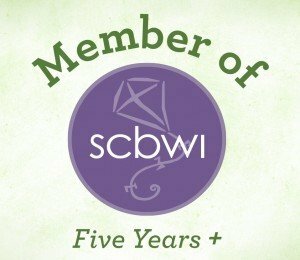 To a kiddo who identifies with you while reading your book, who struggles with a parent who suffers from addiction, what would you tell them? JJK: For those readers, I left a little something for you in the Author’s Note at the end of the book. I hope that you take solace in those words. Writing transparently is cathartic but self-care is paramount—so write within your comfort zone but push yourself when you are ready.